Since adding a second child to our family, I have learned to not necessarily work harder, but work smarter. Meghan’s been asking for French toast for breakfast often, and as much as I would love to be able to comply and make it fresh for her, some mornings that just isn’t possible. I had a few options. I could buy the frozen French toast sticks you find in the freezer section of the grocery store. Even before I looked, I knew that probably wasn’t the best option. But when I did investigate, I found far more ingredients than I wanted, including unhealthy oils and extra sugar. Why do you have to add sugar to French toast?! These are already going to be topped with maple syrup, I don’t need even more sugar. Plus, I knew the ingredient “dried egg whites” wasn’t as healthful as the full, farm fresh eggs I would use. Next option. Limit French toast to weekends when we Daddy is home and we don’t have to rush to preschool. Oooooorrrr…I could make my own batch of French toast and freeze them. Guess which option I chose? Yep. Work smarter, not harder. 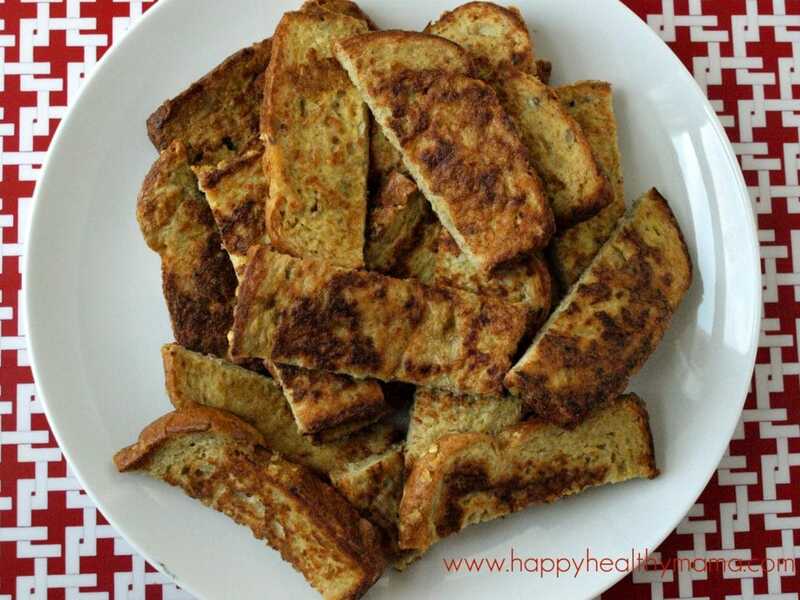 One big batch of French toast is simple to whip up. And get ready to freeze. You don’t need any fancy-pants bread for this French toast. Kids like it with regular sandwich bread, homemade or store bought. Of course it would also be wonderful with a loaf of brioche or challah. You decide. Once you have the big batch made, it’s easy to pull a few sticks out of the freezer and pop them in the toaster for a quick breakfast. Meghan prefers hers topped with peanut butter, and then dipped in a little maple syrup. Choose your toppings and enjoy your healthy, quick breakfast! In a large, shallow bowl, mix your eggs, milk, and cinnamon and vanilla, if using. Preheat your griddle or pan over medium heat. If you aren’t using non-stick, coat with oil or butter. Dip each piece of bread in the egg mixture and turn to coat. Cook in the hot pan until golden brown to your liking, about 2-4 minutes per side. Allow the slices to cool, and then cut each slice into 4 sticks. You can cut multiple pieces at once. 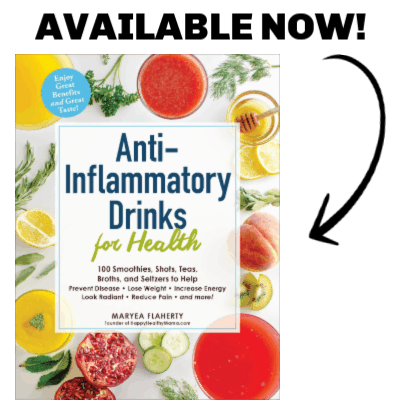 Can be stored in the freezer in a glass container or a Zip-lock freezer bag for 1-2 months. I like Meghan’s French toast topping style. PB is my favorite too! Make ahead meals like this are things I definitely plan to have on hand for when hunter gets here. I love this! I can’t stop myself from making extra of just about everything and freezing right now. I was thinking of doing waffles today and then after I make more bread I’m going to try these! I know my kids will love them, but let’s be honest, I’m going to eat just as many as them, haha. I reheat in the toaster! No, they aren’t soggy at all. I’m going to be needing make ahead meals so this is one to remember! …. I’m with you, why do you need to add sugar to something that you will add sweetness to anyway?!? ….Keep sharing your working smarter ideas! 🙂 LOVE them! Awesome idea! With my eldest starting kindergarten in the fall, I’m looking for healthy, quick & fun – because that is his main criteria right now 😉 – breakfast ideas. Thanks for sharing! I’ve found that I can stick leftover pancakes in the fridge and warm them up for snacks and breakfast again the next day, but I never thought about doing the same with french toast, or better yet, freezing it! Awesome idea and so good to know! I do this too. It is also a great way to use extra hamburger or hotdog buns. So much better than the ones you buy! I LOVE French toast. However, I like the French Toast leftovers better than fresh off the griddle. So the ones that sit in the fridge for a day are the ones I eat after heating them up and topping with syrup. Did you use the homemade bread for these? I’m really picky about bread and how it can be empty calories if you’re not careful. Is there a store-bought bread you recommend?? This is certainly a trick I will make use of! I didn’t use homemade bread for these ones. It’s been a crazy couple of weeks over here. When I buy store bought bread I buy Brownberry 12 Grains bread. For myself I buy Ezekiel sprouted grains bread, but unfortunately Tim and Meghan don’t like that kind. I think it’s the healthiest store bought bread I’ve found. These look great. I love making big batches and freezing it for future use. Ive done it with waffles but not French toast. My son is on a French toast kick too, so this is perfect timing. Thanks!! What a smart mommy you are! I loved when my dad would make us french toast on the weekends. Too bad they didn’t make extra to freeze for us. Great idea! I often freeze homemade waffles and pancakes for the kids to pop into the toaster in the mornings, but I’ve never thought to do that with french toast. They might appreciate a change. I like the idea of them dipping into maple syrup instead of drowning their entire plate in it! I love this, thank you. We have two- 25 month olds who LOVE to make a mess with maple syrup, peanut butter and honey (well basically any topping). So one morning when I was making French toast, I decided to add the maple syrup (a little less than 2 T) to the egg mixture prior to dunking the wheat bread (that way we can skip the side of maple syrup). It came out deliciously sweet and with that wonderful pure maple syrup flavor WITHOUT the sticky mess of syrup all over the table, their arms, their clothes – oh and my favorite, in their hair. I tried it again with peanut butter and it worked just as well. O this idea is GENIUS! 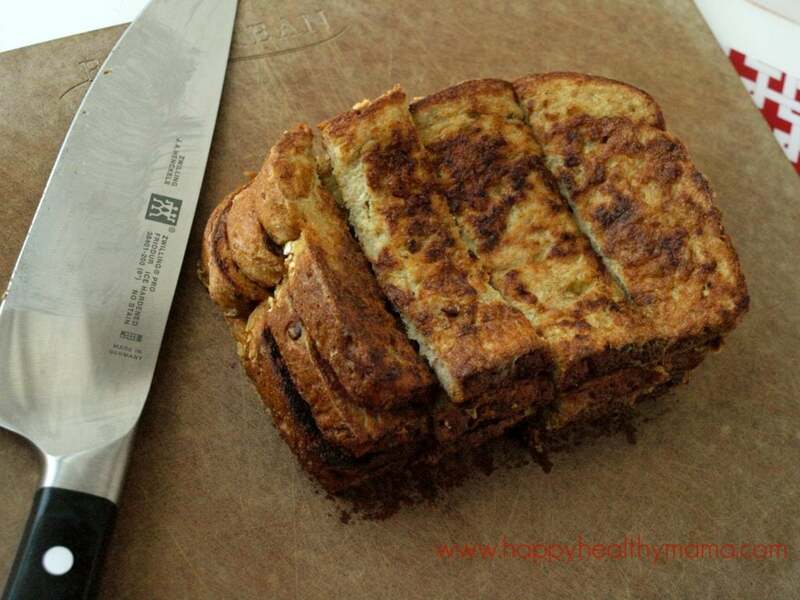 I too have two young toddlers(20 months) and a side of syrup or PB is NOT an option for them if I want to keep my sanity… I am making a loaf of french toast this weekend(I will freeze in the bag the loaf came in to save money and keep our plastic use down) and I am going to try this! I am SO excited I found your site and saw this comment! This is one of my favorite make ahead meals. When Amelia started kindergarten 2.5 years ago (sniff, sniff) I quickly found that I needed easy, healthy, substantial breakfast foods that would hold her over until morning snack. I bought a box of the fancy, organic french toast sticks on a whim and she loved them. 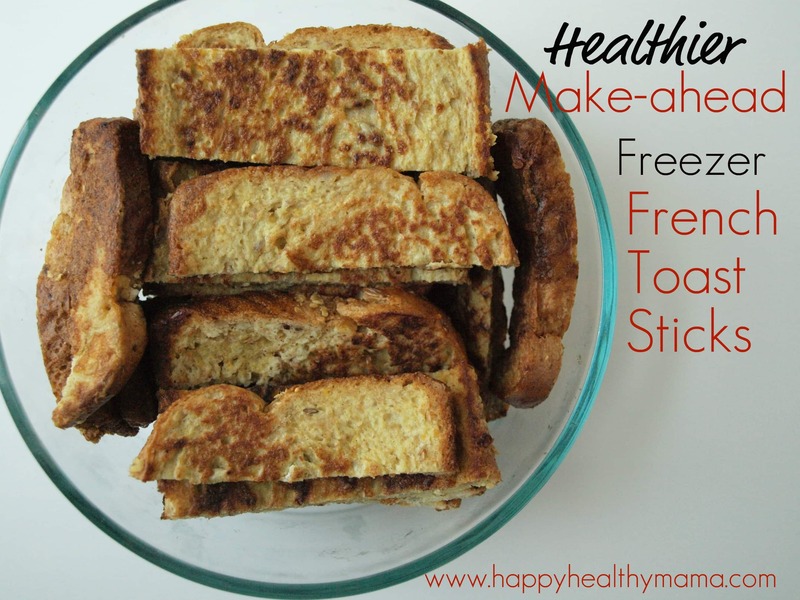 But, I knew I could make them just as healthy (if not more) and for at least half the cost ($5 for frozen organic french toast sticks!). After I made them once, I realized just how easy it was and now my freezer is rregularly stocked with these (and waffles and pancakes). Yes, I should have mentioned how much cheaper these are! Good point. this is brilliant, you know that right? going to send it to my sis in law too! wow, what a great concept!!!! Thank you so much!! I am the first time mom of a 16 month old and feeding my lovely everyday is an exercise in….not frustration because she is a good eater for the most part but anxiety because I want her to have a good relationship with food and love to eat healthy. I am so excited to read through all your posts and start cooking!! 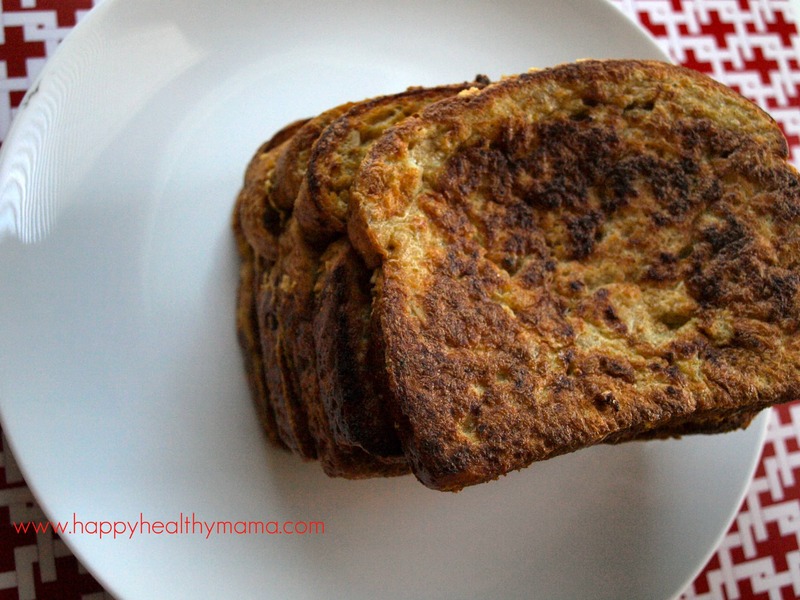 Have you tried applesauce as a topping for French toast? It’s healthy and, with a sprinkle of cinnamon, gives a flavor reminiscent of apple pie. Just make sure it’s warm or at room temp at least. I grew up with this version and never heard of syrup on FT until I left home. Yum! I’ve never tried it but it sounds great. I tried the French toast sticks. Oh my goodness! They’re delicious and so easy to do. I didn’t have your exact ingredients, so I used what I had on hand – but I did link to your recipe in the blog post. Love your blog! Yours is the first recipe that did not call for sugar! Thank goodness for that. I am definitely trying this.